With a selection of over 6000 tracks, we are able to cater for every occasion from the christening of the new baby upto the 100th Birthday and everything in between. Getting the music right for your event can be hard work. This is why we offer a wide range of music from the 60's to the present day, which allows you to pick some of the music you want to hear at your disco. Of course this is only an option and you can leave the choice of music to us if you'd prefer. Currently we hold over 6000 tracks from over 5 great decades. However, it is impossible for any mobile disco to carry every music track that could possibly be wanted. For this reason, if we cannot find the exact track you want or you want to provide your own music to be played then we can play any download track you give us or can acquire any special songs if given enough notice. We understand that loud music is not always wanted at family gatherings and other more social events. This is why we pride ourselves on getting the music volume just right for you and your guests. Why Not make it an extra special night to remember by adding Karaoke to your disco for just an extra £50. 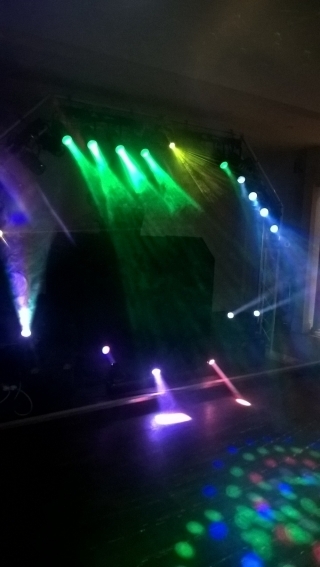 Our combination of good quality equipment, a large music library and an experienced DJ will help to keep your dance floor busy all night long and keep your guests talking for weeks after your event.